Outline Seen from the perspective of the Impala, Sam and Dean go on the hunt for what turns out to be a rare type of vampiric ghoul. Dean is having a case of cabin fever and he claims that he's washed every car in the Bunker twice. Sam tells him that he hasn’t made any progress in his search about the Darkness. When Sam tells Dean that there might be a case, Dean tells him that he can fill him with the details on their way there. Sam tells Dean about a possible case in Quaker Valley, Oregon. The local sheriff, Dwayne Markham was found in the woods with his body mauled, so the local officials categorized it as animal attack. Sam believes it might be a werewolf attack. They both agree that it was thin but continue on to Oregon anyway. Castiel calls, telling Sam and Dean that he couldn’t find anything related to the case they were handling. The boys insist that Castiel's only job right now is to focus on helping himself get better, with Sam offering up his room and Netflix to keep Castiel distracted. Dean pulls over to a roadhouse despite Sam’s objections, prompting Dean to remind him that it's the same roadhouse where they had a good time with a hunter by the name of Heather after a wendigo case a few years back. Sam tells Dean to have fun, but he is going to find a diner and do some research on the case. As the night changes into the dawn, Dean wobbles out of the roadhouse and gets inside the Impala to take a quick nap, muttering to himself that “Mistakes were made” as he closes his eyes. He's soon startled by a woman in the backseat asking, “Who are you?” Sam’s voice is heard from the back explaining to the girl that it was his brother. Dean leaves the car to give Sam and Piper, a waitress from the diner, some privacy. As the two are saying goodbye to each other, Piper looks for her hairpin but can't find it in the car. As they get back on the road, Dean begins teasing Sam for his one night stand and puts a tape in the deck. Bob Seger’s "Night Moves" starts playing, and soon the two begin singing along to the song. The boys share their thoughts about settling down, on which they have a very different opinions. While Dean thinks one night stands are all they can have, and are lucky to get, Sam still believes that there’s a chance for them to have something more meaningful. Believing Sam to be exhausted, Dean tells him to get in the back and get some rest. 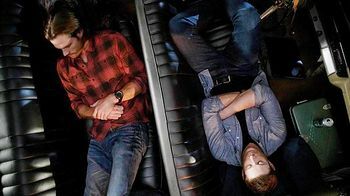 Sam wakes up in the backseat and is offered a can of beer by Dean, who tells Sam that he was singing the song that their mom loved in his sleep. Sam tells Dean about his dream or vision and the message that it brought. He says that the message might be from God, but Dean doesn’t believe him. Sam tells him that he had his first vision after praying in the hospital, coming clean that he got infected by rabids during that time. However, Dean is still convinced that whatever Sam saw was only a fever dream, a side effect of the infection. Dean tells Sam that he dreams about their Dad all the time, but Sam isn’t convinced and still believes that God or something else is trying to send them a message. Dean tells Sam that whatever it is, the Darkness is on them and they are the ones who need to fix this, and they agree to focus on the case they are working. The boys finally reach their destination. Dean goes to see the corpse -- the body was totally mauled, drained of blood and the heart is missing. Dean coins the term were-pyre to describe the creature that attacked the sheriff. Sam gets a copy of the report from the Sheriff's replacement, Deputy Donelly. The deputy shows up by the car suddenly, greeting them. He recommends a local motel and a restaurant that serves the best steak in the state, Aunt Mel's. The boy head to the restaurant, where Dean is pissed to discover that they have valet parking. He reluctantly gives the key to Jessie, the valet. Jessie pulls away excitedly and drives to pick up her friend. The girls then cruise around town and do donuts in a vacant lot until Jessie's boss calls and tells her to come back right away. Jesse’s friend can’t find her purse when she's getting dropped of, but Jessie is in a hurry -- worried about getting fired -- and forces her to leave the car without it. When she gets back to the restaurant, Dean is oblivious to her little adventure and grudgingly praises her for taking good care of his baby. Dean drops Sam at the Sheriff's house to ask if the wife had seen anything, while he goes back to the woods where the body was found. He feels that something is not right with the crime scene photos. Castiel calls while Dean is observing the scene -- he's found a creature in the lore that matches the boys’ findings. Dean insists on calling it the were-pyre, but Castiel doesn’t get it. The creature he's found is called a Whisper. Silver will work to kill it, but it's better to decapitate it to be sure. Dean reports his findings that the crime scene was staged. Castiel continues to explain the lore on Whispers while outside the car, the deputy stops by. The deputy then attacks Dean. Castiel, oblivious to what's going on, continues talking, only to find that some of the details of the case don’t match a Whisper's characteristics. He agrees to call whatever they're after a "were-pyre" instead. After hearing a gunshot over the phone, Castiel stops his monologue and calls Dean's name urgently until Dean finally comes back to the phone. Dean had decapitated the deputy’s head but weirdly, the head was still alive. He reports the result to Castiel, puts the head in the cooler, and takes a picture of the were-pyre’s teeth for Castiel to continue researching. After ending the phone call with Castiel, Dean finds missed calls from Sam and calls him back immediately. Sam says that he got jumped and he managed to escape, taking the unconscious Mrs. Markham with him. Dean goes to pick them up. The machete he used to decapitate the deputy falls under the front seat as he drives. Castiel calls again after Dean picks Sam and Mrs. Markham up, and he informs them both that the creature is a ghoul- and vampire-like creature called a nachzehrer. Dean coins another new term, a ghoul-pyre. Castiel explains that the only way to get rid of a nachzehrer is to remind it that it's dead by using a Charon’s Obol: a coin in ancient Greek mythology that was put inside the mouth of the dead so that they could use it as a currency to be taken across the river to the underworld. The boys need to put a copper coin inside the mouth of the nachzehrer and sever its head. If they manage to kill the alpha, the rest of the pack will revert to being human. The boys need to find pennies older than 1982, because after that, they were no longer made of copper. Sam goes inside a mini market to get change. In the backseat of the Impala, Mrs. Markham regains consciousness and Dean tries to explain the situation to her. She hears a noise from the cooler box and opens the lid and is shocked to see an animated head inside. Dean moves the box to the trunk. Mrs. Markham then says some things about family and asks Dean if he agrees that we do everything for our family. She then attacks Dean. The deputy had turned her and her kids, but her husband didn’t want to be turned, which is why he was killed. Mrs. Markham overpowers Dean and drives off with him unconscious and handcuffed in the backseat. She goes back to the woods to put the deputy’s head and body together. Once again whole, the deputy starts the car and they all drive off. The deputy turns out to be the alpha. He was living a quiet life but since the Darkness came, he's been building up an army. He claims that the Darkness will come for everyone. He reveals to Dean that he has Sam heading into a trap and he plans to turn Sam. Dean manages to find Piper's lost hairpin and gets himself unlocked. He then grabs the alpha while he's driving, and they crash into a road block. Dean also manages to find the purse that Jessie’s friend left earlier, and inside is a wallet filled with pennies. Next to it on the floor of the car is the machete that he'd used earlier. After a vigorous fight, Dean manages to kill the alpha. Dean takes a look at how battered the Impala is and whispers, “Oh, Baby. I'm so sorry,” while stroking the car gently. Mrs. Markham wakes up with her humanity restored and immediately asks Dean to help her get to her children. Dean agrees, figuring Sam will likely be nearby. After some issues getting the battered Baby to start, they roll off as a very grateful Dean blows a kiss to the car. Dean starts the engine again. With the whistle and the rumbling of the engine, he says, “There’s my girl.” He turns up the volume and "Night Moves" starts to play as the boys drive back to the Bunker. Dean: Where's the rest of the beer? Dean: Mistakes were made, mm-hmm. Dean: Piper? That's awesome. Heather. One-night wonders, man. Shoot, we're lucky we still get that at all. Sam: Hey, Dean. Um... You said when you saw the Darkness you weren't sure if it was the real thing or a vision, right? I think I've been having visions too, lately. It's just images. I mean, more of a feeling, really. But I just had one right now, and-and Dad was in it. But it wasn't Dad like the Dad I grew up with. It was Dad when he was our age. And I guess it wasn't really Dad, just someone pretending to be Dad. Dean: Okay, what makes you say that? Sam: For starters, he told me everything I wanted to hear. Dean: As far as Dad goes, I dream about Dad all the time. Dean: 'Course I do. It's usually the same one, too. We're all in the car, I'm sitting in the driver's seat, and Dad's sitting shotgun. But there aren't any shotguns, and there's no monsters, no hunting. There's none of that. It's just, he's teaching me how to drive. And I'm not little like I was when he actually taught me how to drive. I'm sixteen and he's helping me get my learner's permit. Of course, you're in the back seat, just begging to take a turn. We pull up to the house -- the family house. I park in the driveway, and he looks over and he says, 'Perfect landing, Son.' ...I have that dream every couple of months. It's kinda comforting, actually. Sam: I always dream about Mom. Usually the same kind of thing, though. Dean: Hey, Cas. Tell me you got something that doesn't involve chicks in prison. Sam: Bet you never thought you'd say that out loud. Castiel: A ghoul and vampire-like creature. Dean: Oh, Baby... I'm so sorry. Sam: So it was Deputy Dumbass, huh? Dean: Yeah, Deputy Dumbass. You know he was trying to build an army? Sam: Dean... Even the monsters are scared. Dean: Let 'em be. You and me: we're stopping this now. Dean: Okay, Mom. Let's go home. Sam: You know what? We are home. The title of the episode "Baby" refers to Dean's nickname for the Impala, first used in 2.03 Bloodlust and continued throughout the series. Dean uses the diminutive in the following episodes: 2.03 Bloodlust, 2.05 Simon Said, 3.08 A Very Supernatural Christmas, 6.15 The French Mistake, 7.06 Slash Fiction, 7.01 Meet the New Boss, 8.02 What's Up, Tiger Mommy? and 9.04 Slumber Party. Sam: Right now is the time for you to focus on getting better. This is just a milk run. We got it. So try and relax. Read a book; watch some Netflix. Sam: Go to my room. Turn on the TV. You'll figure it out. Netflix is a global provider of movies and TV series since August 29, 1997. A milk run refers to an easy and uneventful trip. Sam: Are you serious? Dean it's late, I'm exhausted, and-and starving. And this place -- not even Swayze would come to this roadhouse. Patrick Swayze starred in the 1989 action film Road House. Sam: I tried to give her my number. You know what she said? Sam: Is everything a Bob Seger song to you? Dean quotes "We Got Tonight" from the album Stranger in Town. "John": God helps those who help themselves. An ancient Greek phrase found in Aesop's Fables. Dean: Say it with me -- a were-pyre. A were-pyre is a werewolf-vampire hybrid. This may be a reference to the monster of the same name from the MMORPG AdventureQuest Worlds. Dean is referred to by Deputy Donelly as "Agent Walsh," a reference to musician Joe Walsh, who is most notably the guitarist for the Eagles. Castiel: I'm mostly confused. I'm not sure how orange correlates with black in a way that is new. Dean: Step away from the Netflix. Dean: Turns out I did shoot the deputy. Dean is referring to the lyrics of the song "I Shot the Sheriff" by Bob Marley. In 3.12 Jus in Bello Agent Victor Henriksen shoots Sheriff Melvin Dodd and says "I shot the sheriff." To which Dean replies, "But you didn't shoot the deputy." Donelly: It's my fault, really. You weren't properly trained. But everyone deserves a mulligan, don't they? That's all my people were trying to do, Lily. They weren't going to kill you. Hell, I need you. I need all the help I can get. A mulligan is a golf term used for a second chance after a blunder, that won't count against a person's score. Live tweets from during the episode, including pictures from filming. Teach Grant, who played Deputy Donelly, previously played Christopher Fisher in 7.04 Defending Your Life. He also appeared in the movie Devour alongside Jensen Ackles as Conrad, the best friend of Jensen's character. Sarah-Jane Redmond, who played Lily Markham, previously played Kathy Randolph in 5.08 Changing Channels. There was no score for this episode. All music was diegetic: either coming from an outside source or the Impala's cassette deck. The scenes used in the episode for the Impala's cassette deck were used from 5.22 Swan Song. In the opening of the episode, inside the the bloodied Impala can be seen the plastic green army man in the ashtray, the Legos in the air vents, and Sam and Dean's initials scratched on the back window sill. The history of these objects was described in 5.22 Swan Song. Dean: And hey, look at that! You're finally not a virgin anymore. Sam and Dean became born-again virgins in 9.08 Rock and a Hard Place. "John"'s line, "You okay, pal? You look a little spooked" is the same thing John said to Sam when Sam and Dean time-traveled back to 1978 to save their parents in 5.13 The Song Remains the Same. Matt Cohen's appearance in the episode was kept a secret. He was even listed on the daily call sheets as "Leonard Cohen" (Source), with his credit appearing at the end of the episode. Unfortunately a promo for the episode released by Canadian Network CHCH spoiled his appearance, even though they took down the video within hours. 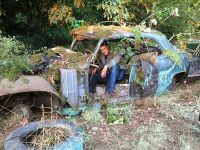 During the filming of the episode, during the scenes where the Deputy Donelly attacks Dean, Jensen found the remains of the Impala that was smashed up at the end of 1.22 Devil's Trap. This page was last edited on 14 April 2019, at 11:23.